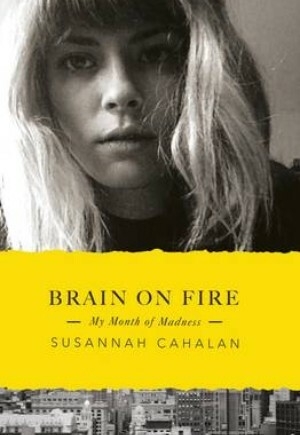 "Brain on Fire" is the stunning debut from journalist and author Susannah Cahalan, recounting the real-life horror story of how a sudden and mysterious illness put her on descent into a madness for which there seemed to be no cure. 'My first serious blackout marked the line between sanity and insanity. Though I would have moments of lucidity over the coming days and weeks, I would never again be the same person ...' Susannah Cahalan was a happy, clever, healthy twenty-four-year old. Then one day she woke up in hospital, with no memory of what had happened or how she had got there. Within weeks, she would be transformed into someone unrecognizable, descending into a state of acute psychosis, undergoing rages and convulsions, hallucinating that her father had murdered his wife; that she could control time with her mind. Everything she had taken for granted about her life, and who she was, was wiped out. This is Susannah's story of her terrifying descent into madness and the desperate hunt for a diagnosis, as, after dozens of tests and scans, baffled doctors concluded she should be confined in a psychiatric ward. It is also the story of how one brilliant man, Syria-born Dr Najar, finally proved - using a simple pen and paper - that Susannah's psychotic behaviour was caused by a rare autoimmune disease attacking her brain. His diagnosis of this little-known condition, thought to have been the real cause of devil-possessions through history, saved her life, and possibly the lives of many others. Cahalan takes readers inside this newly-discovered disease through the progress of her own harrowing journey, piecing it together using memories, journals, hospital videos and records. Written with passionate honesty and intelligence, "Brain on Fire" is a searingly personal yet universal book, which asks what happens when your identity is suddenly destroyed, and how you get it back. "With eagle-eye precision and brutal honesty, Susannah Cahalan turns her journalistic gaze on herself as she bravely looks back on one of the most harrowing and unimaginable experiences one could ever face: the loss of mind, body and self...a mesmerizing story". (Mira Bartok, "New York Times" bestselling author of "The Memory Palace"). Susannah Cahalan is a reporter on the "New York Post", and the recipient of the 2010 Silurian Award of Excellence in Journalism for Feature Writing. Her writing has also appeared in the "New York Times", and is frequently picked up by the "Daily Mail", "Gawker", "Gothamist", "AOL" and "Yahoo" among other news aggregrator sites.